Hebe ‘Blue Star’ is a compact, rounded, evergreen shrub, reaching 16 in (40 cm) high. The spear shaped leaves are grey-green, and up to 1.6 in (4 cm) long. It produces masses of white flowers over a long period in summer. This new cultivar is apparently a Hebe albicans hybrid. 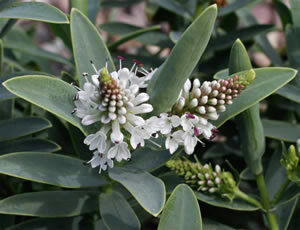 A hebe that is hardy in the UK.